I am a geospatial scientist who focuses on geospatial research and development to integrate and evaluate multi-sector dynamics in human-Earth systems. I specialize in geospatial algorithm development; multi-model integration for models with varying scale; workflow optimization; software development; leading teams of developers and scientists; dissemination of work through peer-reviewed publication and presentations. With the ability to simulate historical and future global water availability on a monthly time step at a spatial resolution of 0.5 geographic degree, the Python package Xanthos version 1 provided a solid foundation for continuing advancements in global water dynamics science. The goal of Xanthos version 2 was to build upon previous investments by creating a Python framework where core components of the model (potential evapotranspiration (PET), runoff generation, and river routing) could be interchanged or extended without having to start from scratch. Xanthos 2 utilizes a component-style architecture which enables researchers to quickly incorporate and test cutting-edge research in a stable modeling environment prebuilt with diagnostics. Major advancements for Xanthos 2 were also achieved by the creation of a robust default configuration with a calibration module, hydropower modules, and new PET modules, which are now available to the scientific community. Funding statement: This research was supported by the U.S. Department of Energy, Office of Science, as part of research in Multi-Sector Dynamics, Earth and Environmental System Modeling Program. The Pacific Northwest National Laboratory is operated for DOE by Battelle Memorial Institute under contract DE-AC05-76RL01830. The views and opinions expressed in this paper are those of the authors alone. Research in water-energy-land systems (WEL) [1, 2] and understanding the implications of water scarcity on WEL systems [3, 4, 5] is rapidly progressing. Additional impacts to water resource management are now also being considered when addressing supply-demand cycles and reservoir effects from potential water shortages . Xanthos 2 was created to accommodate these progressive advancements in water-energy-land science that support cutting-edge research in human-Earth systems interactions. Currently, Xanthos 2 provides water supply, accessibility, and hydropower potential to the Global Change Assessment Model (GCAM) which is an integrated human-Earth systems model [7, 8, 9]. Xanthos 2 was built upon previous development by Li et al. by creating a Python framework where core components of the model (potential evapotranspiration (PET), runoff generation, and river routing) can be interchanged or extended without having to start from scratch. Xanthos 2 utilizes a component-style architecture which enables researchers to quickly incorporate and test cutting-edge research in a stable modeling environment prebuilt with diagnostics to keep up with advancing science objectives. The new default configuration of Xanthos now supports the Penman-Monteith [11, 12] PET module which incorporates more comprehensive climate drivers as well as dynamic land cover data to allow land atmosphere interactions. The abcd water balance module was also added as the default runoff component to account for groundwater recharge and baseflow in runoff estimates . Additionally, the following enhancements were also made: improved water velocity considerations for the Modified River Transport Model (MRTM) routing module [14, 15], hydropower production assessment and potential capacity modules, and a built-in differential evolution optimization module to calibrate abcd parameters based on benchmark global runoff. Available components for Xanthos 2, their component types, and references to the supporting algorithms. Calling the execute() method after instantiating the Xanthos class will start a run and initialize the logger. The user will be updated as the model progresses through each step and as outputs are generated. Table 2 describes the expected outputs of a Xanthos run using the default core configuration and the accessible water, hydropower, diagnostics, and time series plots post-processing modules. 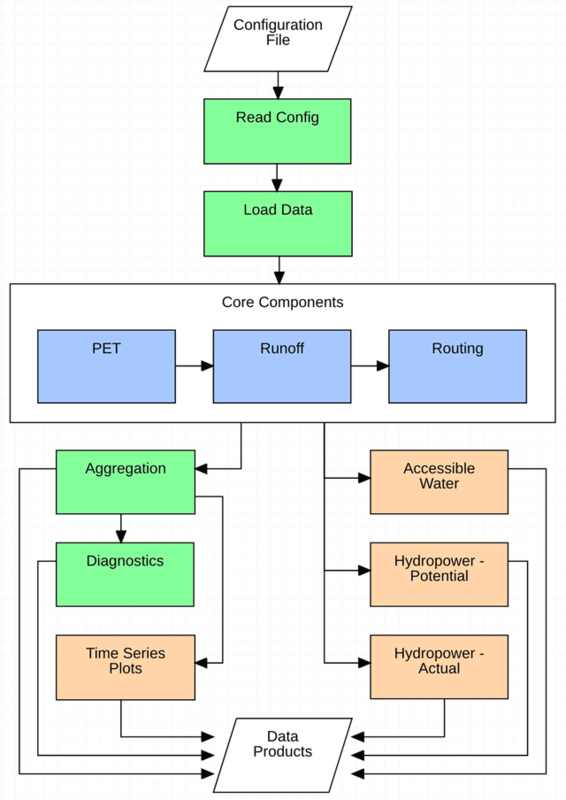 Xanthos expected outputs when using the default configuration and the accessible water, hydropower – potential, hydropower – actual, diagnostics, and time series plots post-processing modules. Xanthos 2 module diagram and workflow for the default configuration. Components in green provide built-in functionality; blue components are the interchangeable core modules; and orange components are post-processing modules that have been extended. The new default configuration of Xanthos contains the abcd water balance module to generate runoff as interpreted by Liu et al. . The abcd module is driven by five aptly-named parameters: a which controls the amount of runoff that occurs when soils are under-saturated; b which controls the saturation level of the soil; c which defines the degree of recharge to groundwater; d which controls the rate of groundwater discharge; and m for snowpack accumulation and snowmelt estimates which was added by Martinez and Gupta . The performance of the abcd module is influenced by per-basin a, b, c, d, m parameters which need to be calibrated based on the chosen climate forcing, PET, and runoff routines. To accommodate the need for recalibration depending on experimental design, we chose to include a preconfigured calibration module in Xanthos 2 that uses SciPy’s differential evolution (DE) optimization function  based off of the algorithm presented in Storn and Price . The DE method is useful for global optimization problems and is a stochastic population-based optimization method . 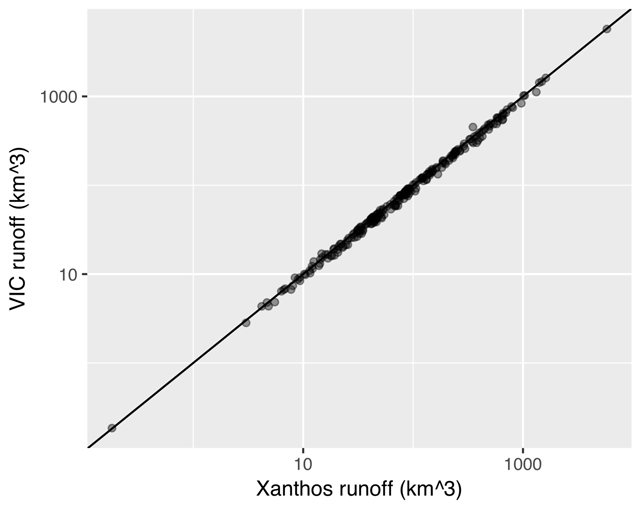 The objective function provided in Xanthos 2 evaluates the Kling-Gupta efficiency (KGE) which is a goodness-of-fit measure between simulated and observed runoff ; however, alternate methods could be utilized. Performance of calibrated runoff by water basin (235 basins globally) from the abcd module using SciPy’s differential evolution optimization function when compared to VIC model runoff forced by WATCH data for years 1971–1991. Note that runoff is converted to km3 by multiplying by basin area, and each data point denotes the long term mean annual runoff of a water basin. This repository uses the Git Large File Storage (LFS) extension (see https://git-lfs.github.com/ for details). Please install GitLFS and run the following command before cloning if you do not already have Git LFS initialized: git lfs install. Clone Xanthos into your desired location git clone https://github.com/JGCRI/xanthos.git. Some Windows users have had better luck with git lfs clone https://github.com/JGCRI/xanthos.git. Make sure that setuptools is installed for your Python version. This is what will be used to support the installation of the Xanthos package. From the directory you cloned Xanthos into run python setup.py install. This will install Xanthos as a Python package on your machine and install the needed dependencies. If installing in a high-performance computing environment, a community user advised that it is best to install the anaconda environment before running the installation command. HPC environments may also require the use of the --user flag in the install command to avoid permissions errors. Setup your configuration file (.ini). Examples are located in the “example” directory. Be sure to change the root directory to the directory that holds your data (use the “xanthos/example” directory as an example). If running Xanthos from an IDE: Be sure to include the path to your config file. See the “xanthos/example/example.py” script as a reference. If running Xanthos from terminal: Run model.py found in xanthos/xanthos/model.py, which passes the full path to the config file as the only argument. (e.g., python model.py <dirpath>/config.ini). Xanthos has been functionally tested on Linux, Mac OSX, and Windows to ensure model reusability. Xanthos has a built-in diagnostics module that compares model outputs to expected output from other mainstream hydrologic models when forced by the same climate assumptions. The calibration module output has also been evaluated as described in the “Calibration module” section of this paper. Exception handling is present throughout the model to ensure data consistency and provide informed feedback to the user for cases where an assumption has been violated. Extensive tests are built-in that validate the configuration file, and the contents thereof, that is provided by the user. Both expected inputs and outputs for each component have been provided as a baseline for comparability if the user decides to extend or alter the code for an intended purpose. Linux, Mac OSX, Windows 7 and 2012 server. We recommend a minimum RAM of 8GB due to routinely processing large datasets. Xanthos 2 was created to be extensible by design. Users can provide their own core and/or post-processing components as described in our GitHub Wiki.5 For example, a new PET module could be added into Xanthos and used instead of the default configuration. This allows those who are advancing the science of WEL research to both test their alternate process through integrated testing with the other core components of Xanthos, and then compare their results against the default Xanthos configuration and validate performance using the built-in diagnostics module. The core components of Xanthos are also interchangeable to accommodate research objectives. An example of extending a post-processing component could be adding a drought module that would use runoff as generated by Xanthos and any other required inputs to examine timing and duration droughts through seamless and citable integration. Xanthos provides a custom issue template, Extending Xanthos Issues,6 which guides the user to provide information that our team can use to quickly address any questions that may arise when extending Xanthos. 1GitHub Wiki for setting up a Xanthos run: https://github.com/JGCRI/xanthos/wiki/Tutorial-1:--Setting-up-a-Xanthos-run. 2GitHub Wiki for available modules: https://github.com/JGCRI/xanthos/wiki/Available-modules. 3GitHub Wiki for the abcd calibration module tutorial: https://github.com/JGCRI/xanthos/wiki/Tutorial-3:--Calibrate-the-ABCD-runoff-model. 4GitHub Wiki for adding components: https://github.com/JGCRI/xanthos/wiki/Tutorial-2:--Adding-new-components-to-Xanthos. 5Custom issue form for extending Xanthos: https://github.com/JGCRI/xanthos/blob/master/.github/ISSUE_TEMPLATE/extending-xanthos-issues.md. Edmonds, J and Reilly, J M 1985 Global Energy: Assessing the Future. In: New York: Oxford University Press, 317. Monteith, J L 1965 Evaporation and environment. Symp Soc Exp Biol, 19: 205–224. Hargreaves, G H and Samani, Z A 1982 Estimating potential evapotranspiration. J. Irrig. Drain. Div, 108: 225–230. SciPy 2018 [ONLINE] SciPy-Optimize-Differential Evolution. https://docs.scipy.org/doc/scipy-0.17.0/reference/generated/scipy.optimize.differential_evolution.html#r140 [Accessed 27 July 2018].